Cupcake had a blister on her heel from her new sneakers, which had received a compliment from me prior to the trip. The sneakers, not the blister—you should have seen the old ones. Anyway, AS wanted her to get some more comfortable shoes so her blister could have a chance to heal and wouldn’t impact her enjoyment of the trip. She felt that Keene sandals would work for both light hiking and city walking, which was what we had intended to do. To get the new shoes, we had to go downtown, and that’s when we ran into Belle Chere. Lots of streets were closed, parking “entrepreneurs” were charging $10 and $15 for a few hours, and there were wall to wall people. With the aid of my ever bitchy GPS, I decided to drive around until I got as close to the outfitter as possible. As it turned out, I was able to park a block away for $4. So, there I was in Asheville, with two women buying shoes. 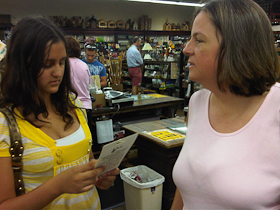 We were at the Mast General Store, which is a popular and old North Carolina outfitter. We quickly found the women’s shoe section. After a couple hours of trying shoes, or so it seemed, they were done, and Cupcake had her Keene sandals. AS then told me that this Mast store didn’t have as much “stuff” as the one in Boone. I told her there was an upstairs. Mistake. After another few hours of looking at various and sundry crap, I had to perform a “double Mastectomy” to get them out of there. Once out on the sidewalk, I asked if they wanted to take in some of the arts festival but got only negative grunts. Out of the unintelligible gutteral utterances (gutterances? ), I made out something that sounded like “foood… eeeeat”. I knew what that meant. I have to maintain a kind of remote blood sugar monitoring station for AS. When she gets hungry, she gets cranky. The last thing I needed was a cranky AS after a shoe shopping episode. So, we got into the van, endured some good natured drunken mockery from some sodden festival goers, and high-tailed it toward the quieter outskirts of Asheville to find another non-chain restaurant. The Flat Rock Grill looked good from the outside. On a previous trip, Zbeard and I had talked about having dinner there but never did. So, this time, it was a “go”. No motorcycles in the parking lot, though. AS didn’t care. But first, we searched for and found a nearby Geocache. Cupcake got the honors there. 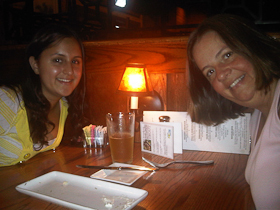 Flat Rock turned out to be a decent place, well decorated, with excellent food, and fast service. And beer. I had the locally caught trout. It was very, very good. During dinner, I caught AS and Cupcake whispering about something. It turned out that they thought that the waitress’ complexion was of a color not available as a standard issue in nature. I don’t know whether they were accusing her of going to a tanning parlor or using makeup or what. Yes, this was yet another thing I would have never thought of had I been alone or with another man. I am always amused by these unpredictable creatures of the opposite gender. I had a fine time: Nice dinner, good company, the mountains tomorrow—what more could a Turkey want? We took turns in the bathroom and conked out for the night. Day Two would give us some time in the mountains before high-tailing it north to Pittsburgh. Look for it in our next installment. I love Asheville. Of course, I would have taken in the art festival but each to her own. Sounds like the food was worth the shopping. Don’t remind me of pepto bismol. It brings back memories of a trip through Italy. I can’t even think of it or look at it now and my stomach starts to churn. The smell of it would send me to the underside of the grass. PS I am hoping the weather cools as you head North. We have had 35 degree C weather here for most of the summer. I might as well have spent my summer in a place called Orlando.